Boogie Woogie Flu: Weegee Speaks! "It's like a modern Aladdin's lamp. You rub it--in this case, the camera-- you push the button and it gives you the things you want"
Today's mp3s come courtesy of my friend Laura Levine, fellow photographer, artist, and proprietor of Homer & Langley's Mystery Spot Antiques. 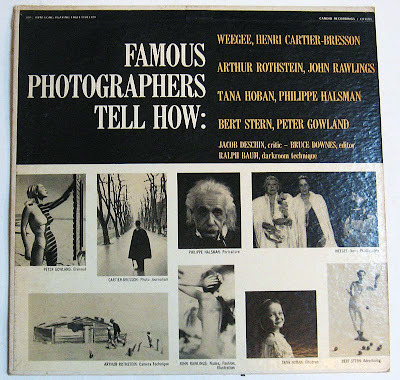 Recently, Laura purchased a collection of 15,000 LPs to sell at the shop, and among them was this very rare and curious gem, Famous Photographers Tell How. Below you can hear Weegee talk about picture-making. It's interesting to hear his voice, which is one of those accents you don't hear so much in New York anymore: part Austro-Hungarian immigrant by way of the Lower East Side and part Elmer Fudd. Peter Sellers based his accent in Dr. Strangelove on Weegee's voice after Weegee visited Kubrick's set. One of my favorite things in Weegee's classic 1945 book, Naked City is the last chapter called "Camera Tips" where he gives away some of his tricks of the trade. 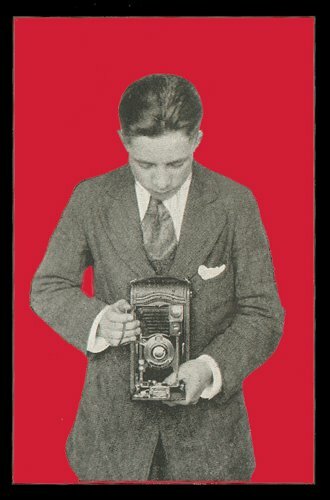 Dated or not, I learned a tremendous amount when I first read it, about picture taking, and about Weegee. 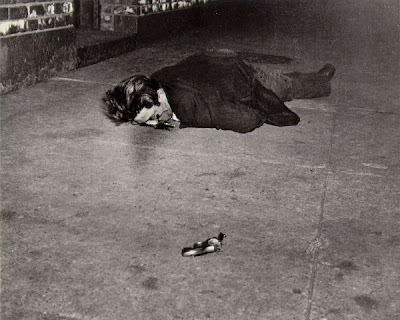 "Now the easiest kind of a job was a murder, because the stiff would be laying on the ground. He couldn't get up and walk away and get tempermental and he would be good for at least two hours." "I will walk many times with friends down the street and they'll say 'Hey, Weegee. Here's a drunk or two drunks laying on the gutter' I take one quick look at that and say 'They lack character.' So, even a drunk must be a masterpiece!" A few weeks ago, my friend Chris was in town visiting and we spent part of an afternoon walking around downtown and looking at some of my old favorite places in the city. We came up through Chinatown, and on towards the old police headquarters on Centre Market Place. I told him "Weegee used to live right here, you know." We proceeded up the street, and looking for the John Jovino Gun Shop that had been there since at least the time of the Weegee (he lived upstairs) and I realized it was gone. I found out later that it actually moved around the corner, but something felt strange, like so much of this city that has disappeared in its post-Giuliani homogenization. I've been thinking about it a lot recently as I've been digging through my own archive of photographs that I made in my early days here in New York. I wonder what Weegee would think of the new niceness of his city. He didn't love the misery that the tenements that he grew up in bred - and no one should - but the drama and street theater of New York that he thrived on has been altered in ways that probably wouldn't please him. Weegee was seltzer, sour pickles, and pastrami. 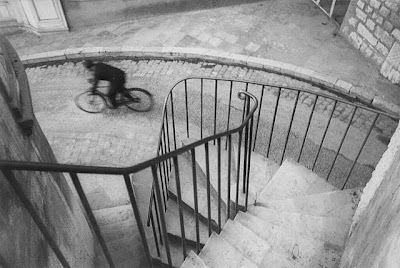 Henri Cartier-Bresson. Eloquent, dry, and French like the great philosopher/mathematician image maker that he was. 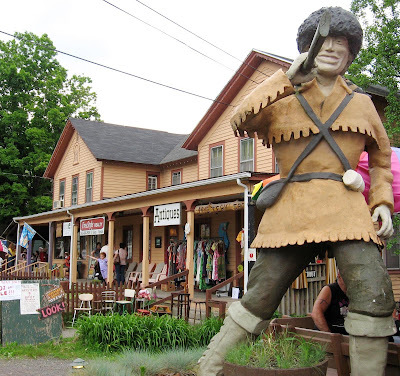 This record and thousands more, as well as interesting curios of old from near and far are available at Homer & Langley's Mystery Spot Antiques, located in downtown Phoenicia, New York. Tell 'em I sent you. thank you. It would be nice to hear Halsman. Still have an old beat-up copy of Naked City with the pages falling out. I'm gonna flip through it now as I listen to his voice, which I had never heard before. It's actually spelled "Ouija," after the French and German words for "yes." Does Homer & Langley's have a circus expert? I would love to hear the whole thing. As a professional photographer this is something akin to finding the ark. Agreed, please just post the whole thing! Yep. This'll make for some primo sampling. :) I've a smoky, spooky noir-esque jam in the works right now that could really benefit with some Weegee "vocals." Please post other ones too. I don't think this kind of knowledge should be kept in exclusivity. What an amazing gem! It's so fascinating to hear him speaking. I'd love to hear the rest! This is fantastic. I'd also love to hear the rest of it. Thank you for sharing this fantastic find. I too would love to hear the whole thing. Pretty pretty please! wow, amazing. thanks for posting these. would love to track down more Bresson interviews, particularly the one running at the "scrapbook" show at ICP in 2007. in does anyone know where i might find it or any others? great stuff ! what a find .. thanks very much for posting, and any more you care to share of these recordings would be greatly appreciated. Very cool. Add me to the list that would like to hear the rest. OMG, it would be a sin to not make this stuff available! I cannot imagine anyone complaining about this rare find! 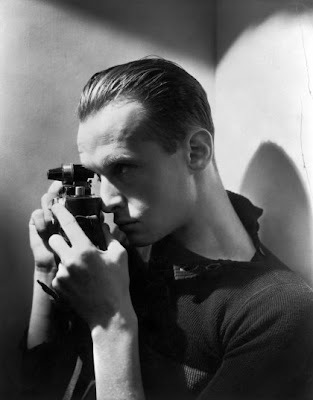 I just finished a History of Photography class in May, and we studied both of these brilliant photographers. This would be great educational material. WOW! I just listened to these and it was incredible. These folks could teach us ALL a lot! I really hope you will make the rest of these recordings available somehow (even if privately) so that these gems can be shared and archived for photographic history. I would be more than happy to contribute for your time! This Weegeemania is a little overwhelming. While I appreciate all of your requests for "the entire LP," I have to say that this is it for now. The record is not in my possession, and I don't have anymore mp3s from it. It is for sale, but as I stated in my post, I'm not the person selling it. The Boogie Woogie Flu is an mp3 blog. I offer things here mostly from my own record collection, or things that are pertinent to the writing in the posts that I find interesting - period. Laura was kind enough to let me post these tracks from the record. I will say, that the two featured tracks from this LP are the most interesting to me. If you like music, look around the blog, there's something there for almost everyone, and check back in the future. As for the person who wrote "I don't think this kind of knowledge should be kept in exclusivity," I'm sorry that you aren't happy with what we gave you here for free. This is not classified information, it's more of a public service, that I do because I enjoy it. There are plenty of books out there that explore this territory. How can we get in touch with the owner of the album? I for one, would love to investigate this further! :) My email is tom@imagesbytom.com Many thanks! All right, now bring the rest too! Watcha waitin fo? Thanks for this treasure! A great post. I enjoyed every word, every picture & every minute of it. All the clever dealers give you your first taste for free. Out of print, may be out of copyright - someone buy the record, digitize it and then sell the tracks.. I'll buy. Yes~ Great!! Please post Halsman. Just Excellent--Thank you for taking the time to post these little treasures. It was easier for me to fully digest what he was saying by reading than listening alone, and I figured it would be good to have it out there for anyone wanting to reference it down the line. If I get time, I'll transcribe the Weegee one as well and let you all know. Thanks to you and Laura for posting these. 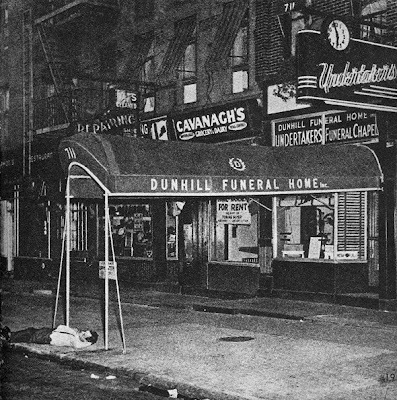 The Weegee transcription is up now too at http://ericamcdonaldphoto.com, under scribbling in the dark. Just thought you might be interested in a new documentary, Weegee the Famous, on SideTV in March and April (www.sidetv.net/channel7), bringing together Amber Films' interview with Weegee's widow Wilma Wilcox (done in the early 80s) with recent interview with/footage of the veteran New York printer Sid Kaplan (who printed most of the Weegee prints in Amber's collection). 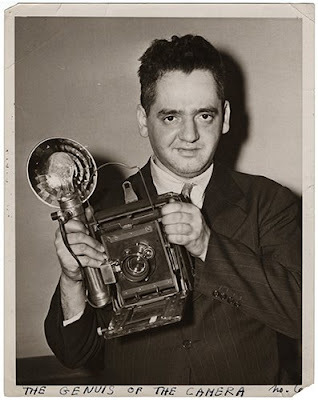 Some interesting insights into Weegee's work. Thanks, sounds great...Sid is an old friend of mine. 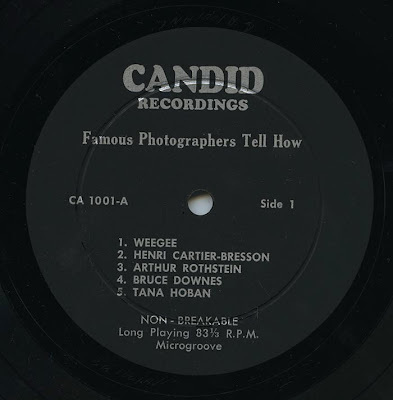 I am selling a copy of this record now. It's up for auction on EBay, ends on Dec. 27th, 2010. Check it out at http://cgi.ebay.com/ws/eBayISAPI.dll?ViewItem&item=180602108597&ssPageName=STRK:MESELX:IT.